Dream Decks…Have You Built Yours? It’s that time of year again when everyone is out on their patios sipping drinks, BBQing, spending time with family and friends…but what better way to do that then on an amazing deck! It’s never fun to have people over and not have a place to entertain…that’s exactly what decks are for! 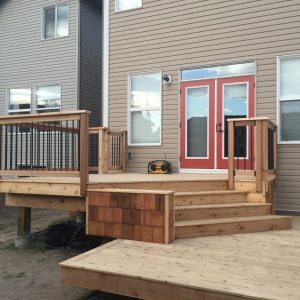 We’ve put together some of our favorite deck projects and included photos that show some of the options (among so many others) that you can dream about with your own deck. This project was built with a pressure treated frame and cladded with cedar. Giving it a modern look and making it smell great! The railing was built with cedar corner posts and powder coated aluminum spindles. This family had plans of adding a hot tub to the one side of the deck and it was designed to accommodate just that! Similar to the project above, this deck and pergola were built using pressure treated lumber for the structure and cladded with cedar. The cedar privacy screen was a nice touch for this project as well. This was specifically designed for outdoor entertaining as this family loved to have friends over for BBQ’s. This deck was built using a pressure treated frame and composite decking and aluminum hand railing. This customer was concerned about having a deck that was built to last and composite suited exactly that. As you can see by the few projects above, the sky’s the limit with options for your deck. You can use simple pressure treated lumber for both the structure, decking and hand railing, you can use pressure treated lumber for the structure and clad in cedar, composite and other options, you can build using cedar hand railing, aluminum hand railing, glass…you name it! Pergolas and other shade structures are a great way to beat the heat and add a nice feature to your project. Whatever you have envisioned, it’s likely possible it can be done. We have put together some awesome deck plans and pergola plans for free…get your copy of them here. If you’re curious to learn more about deck construction or have questions about your project, we’d love to help you! Give us a call: 403 771 8080.